Mentos recently launched a campaign for their new gum. The gum is quite good and so is the campaign. It's built around the idea of people creating art with the patterns that are made by popping the gum out of the grid of its packaging. The TV spot shows an artist creating a mural out of hundreds of Mentos packs. 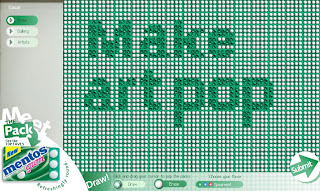 The campaign microsite allows people to make their own art within a Flash interface and submit it for voting by other visitors to the site.